Ricciuti's Uncorks Festivity and Flavor in Washington, D.C.
By popular demand, Ricciuti's, a farm-to-table restaurant nestled between Baltimore and Washington, D.C., expands its Food and Wine Uncorked series. Singles, couples, and foodies alike are promised unforgettable food and flavors. In response to diner demand, Ricciuti’s, a D.C. regional restaurant renowned for fresh, local cuisine, has added new dates to its Food and Wine Uncorked lineup for March and April 2012. These “tutorials with a twist” take diners on a palate-pleasing tour of food, wine, and cooking techniques. The Uncorked dinner series features a multi-course, farm-to-table meal paired with luscious wines and a Vine and Dine seminar, led by Chef and Proprietor James Ricciuti. A recent menu featured native Maryland fried oysters in a tomato fennel broth, served with a lemon polenta cake. The sumptuous starter was paired with a fragrant Viognier from Australia’s Barossa Valley, celebrated for its outstanding vintages. According to Ricciuti, who operates the restaurant with his wife, Amy, “Uncorked celebrates great wine, seasonal ingredients, and the simple techniques that can bring out the best in your cooking. These dinners are a great way to explore new wines and farm-to-table flavors in a casual setting,” he explained. Food and Wine Uncorked will be held at the restaurant, located at 3308 Olney-Sandy Spring Road, on March 27 and April 3 and 17 from 7 to 9:30 pm. The cost is $75 per person and reservations are required, as seating is limited to 15 people. “We designed the Uncorked series for everyone,” Ricciuti emphasized. “Singles, couples, foodies, and newcomers to food and wine are promised an unforgettable night of fun and flavor,” he said. For more information, connect with Ricciuti’s at 301-570-3388 or on the web at ricciutis.com, facebook.com/Ricciutis, or twitter.com/ricciutis. 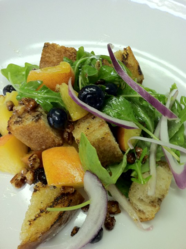 Ricciuti’s highlights locally grown and seasonally-inspired dishes in its casual Montgomery County setting. Their award-winning menu features sustainable seafood and locally-farmed ingredients. An Open Table Diner’s Choice Winner in 2012, Ricciuti’s is celebrated by locals and “foodies” alike for its savory fare and eco-friendly philosophy.